Better than take out Crispy Sesame Chicken!!! This was soooo unbelievably good! Hit the spot when I was craving Chinese food. I paired it with cauliflower rice sautÃ©ed in butter and garlic broccoli(sautÃ©ed in butterðŸ˜‹)! Bonus-use some chopsticks to slow you down and make it last longer! Seriously, make this soon! Donâ€™t forget to check out my what I eat in a day post for today!! 1. Start with the sauce. 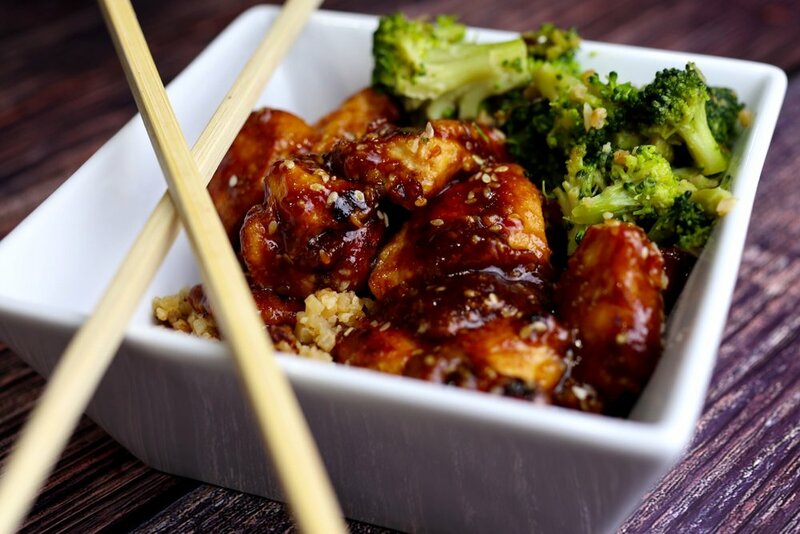 In a small bowl stir together the soy sauce, water, sesame oil, brown Swerve, vinegar, ginger, minced garlic, xanthan gum, and sesame seeds. Set the sauce aside. 2. In a large bowl, whisk together the egg, baking powder, and coconut flour, and a pinch of salt and pepper. Trim any excess fat from the chicken thighs, then cut them into small 1 inch pieces. Toss the chicken in the egg mixture. 3. Add the oil to a large skillet and heat it over medium heat. Once the skillet and oil is hot add the batter coated chicken and spread it out into a single layer over the surface of the skillet. 4. Allow the chicken pieces to cook, undisturbed, until golden brown on the bottom. Then, carefully flip the chicken, breaking up the pieces into smaller clumps as you flip. Continue to cook the chicken until golden brown on the other side. 5. Once the chicken is cooked through and golden brown on all sides(about 5-8 mins), pour the sauce over top. Toss the chicken to coat in the sauce. As the sauce comes up to a simmer, it will begin to thicken. Continue to gently stir the chicken in the sauce until it has thickened, then turn off the heat.